Mystery fiction is a distinct subgenre of detective fiction that entails the occurrence of an unknown event which requires the protagonist to make known (or solve). It is similar to the whodunit in that the clues may often be given to the reader by subtle means. Though it is often confused with detective fiction, it does not require a crime to have occurred or the involvement of law enforcement. The genre has its beginning in the riddles told in Ancient Egypt, Greece, and Rome. Similar stories were told in the middle ages, but the genre didn't really begin to develop until the detective stories of Edgar Allan Poe. The first true mystery novel is considered to be The Woman in White (1860) by Wilkie Collins. Collins wrote several more in this genre, including The Moonstone (1868) which is thought to be his masterpiece. The genre began to expand near the turn of century with the development of dime novels and pulp magazines. Pulp magazines were especially helpful to the genre with many authors writing in the genre in the 1920s. An import contribution to mystery fiction in the 1920's was the development of the juvenile mystery by Edward Stratemeyer. Stratemeyer originally developed and wrote the Hardy Boys and Nancy Drew mysteries written under the Franklin W. Dixon and Carolyn Keene pseudonyms, respectively (and later written by his daughter, Harriet S. Adams, and other authors). The 1920's also gave rise to the most popular mystery author of all time, Agatha Christie. Christie's books are numerous, though her literary reputation has suffered. The massive popularity of pulp magazines in the 1930s and 1940s only increased the interest in mystery fiction. Pulp magazines decreased in popularity in the 1950s with the rise of television, so much so that the numerous titles available then are reduced to two today (and those are Alfred Hitchcock's Mystery Magazine and Ellery Queen's Mystery Magazine). The Detective fiction author Ellery Queen (pseudonym of authors Frederic Dannay and Manfred B. Lee) is also credited with the continued interest in mystery fiction thanks to the namesake magazine which began in 1941. In this ambitious and exciting work Richard Maxwell uses nineteenth-century urban fiction--particularly the novels of Victor Hugo and Charles Dickens--to define a genre, the novel of urban mysteries. His title comes from the "mystery mania" that captured both sides of the channel with the runaway success of Eugene Sue's Les mysteres de Paris and G. W. M. Reynold's Mysteries of London. Richard Maxwell argues that within these extravagant but fact-obsessed narratives, the archaic form of allegory became a means for understanding modern cities. The city dwellers' drive to interpret linked the great metropolises with the discourses of literature and art (the primary vehicles of allegory). Dominant among allegorical figures were labyrinths, panoramas, crowds, and paperwork, and it was thought that to understand a figure was to understand the city with which it was linked. Novelists such as Hugo and Dickens had a special flair for using such figures to clarify the nature of the city. Maxwell draws from an array of disciplines, ideas, and contexts. His approach to the nature and evolution of the mysteries genre includes examinations of allegorical theory, journalistic practice, the conventions of scientific inquiry, popular psychiatry, illustration, and modernized wonder tales (such as Victorian adaptations of the Arabian Nights). 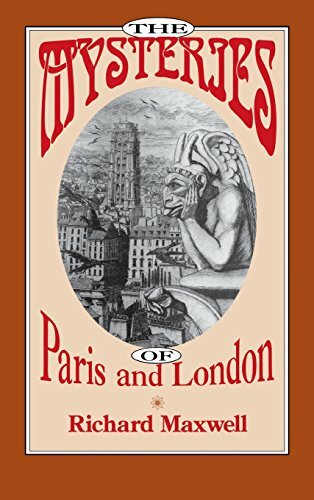 In The Mysteries of Paris and London Maxwell employs a sweeping vision of the nineteenth century and a formidable grasp of both popular culture and high culture to decode the popular mysteries of the era and to reveal man's evolving consciousness of the city. His style is elegant and lucid. It is a book for anyone curious about the fortunes of the novel in thenineteenth century, the cultural history of that period, particularly in France and England, the relations between art and literature, or the power of the written word to produce and present social knowledge.